This tiny little book, which you can read in under an hour, is a reminder of how much Amos Oz is missed today. The book consists of two short speeches he gave in Germany in 2002, then a few pages about the “Geneva Accords” of 2003, and then a look back a decade later in an interview. Oz was a leading light of the Israeli peace camp, a man who believed strongly in a two-state solution and above all, in the fact that both sides in the dispute between the Israelis and Palestinians could be right, and have rights. Sadly, few today at least among the political elites of Israel and Palestine, seem to share this view. And as for how to cure a fanatic, he has some simple strategies, including reading literature and having a sense of humour. 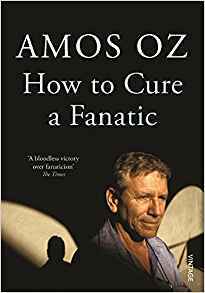 Amos Oz was arguably Israel’s greatest writer, but he was also one of its most decent human beings. May his memory be blessed.